If you had to think of every detail of every act throughout a baseball game, you would become mentally overloaded and exhausted. That is why routines and habits are so important. Motor memory allows you to file away repetition from practice so you can act as if on autopilot. Habits allow you to focus on the more important aspects of performance such as game situations. Unfortunately, sometimes something invades your mind and blocks that reflexive action. 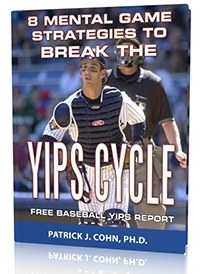 For a pitcher, that invasion is called the yips. McCarthy is 33 years-old and was drafted in 2002. In his 2003 minor league season, McCarthy posted impressive stats (101 innings, 125 strikeouts and only 15 walks). In 2004, McCarthy led all minor league pitchers with 202 strikeouts. McCarthy made his Major League debut in 2005 and, in his 11 MLB seasons, McCarthy has pitched over a thousand innings with 771 strikeouts. Imagine how many additional times McCarthy has thrown the ball considering his little league, high school and collegiate experiences. Everyone would agree that throwing a ball for McCarthy has become an unconscious habit and he no longer needs to think about all the details and mechanics of pitching a baseball. It is as simple as see the target, throw to the target. But for McCarthy, throwing the ball is not as simple as it once was and that mental block, or the yips, is more devastating than returning to pitch after major shoulder surgery. When you have extreme difficulty doing something you have done with ease countless times, you begin to wonder what’s wrong with you. The answer is that nothing is wrong with YOU. The issue lies in your thinking. Motor memory allows you to perform without conscious thinking. 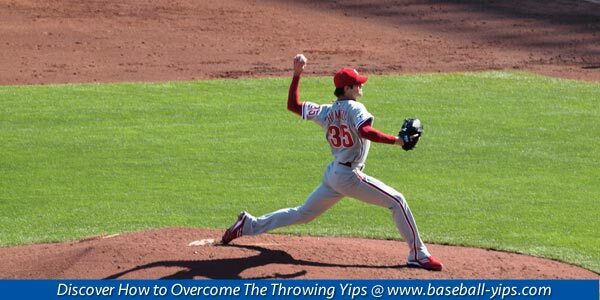 When you start thinking about how to throw the ball or the mechanics of pitching, you create mental interference which disrupts your well-learned action. You turned a non-thinking action into something that you over-analyze. Think back to when you learned the skill of pitching… It was probably one step forward and two steps back. Once you honed your pitching skill, you started getting consistent results. The answer to the yips is to not think. Instead trust that skill you have trained to become a habit. Remember that focusing on mechanics creates mental interference and disrupts your ability to throw the ball. And when you focus on the result of your pitch, this creates anxiety and muscle tension. Instead, you want to trust your motor memory and not try to release the ball properly. Focusing on your prepitch routine can help you stop thinking about outcomes. You also want to focus on the pitch and target, which can help you go on auto-pilot with your action. 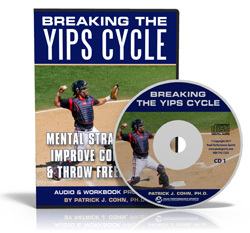 To break the yips cycle, you have to let go of the outcome, what others might think, and free up you arm so you can get back to auto-pitching. The second game of the year I was supposed to be the starting pitcher. When I was warming up I couldn’t throw to my catcher 20ft away. I started getting more and more tense and frustrated. My release point and arm angle was screwed up. When I went onto the mound and threw my warm up pitches I threw three over my catches head and hit the backstop and threw one that bounced in front of the plate. 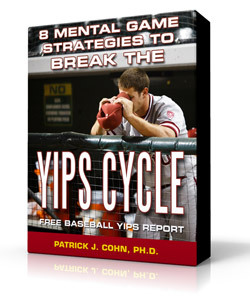 This offseason I’m working on the mental side of my game and hopefully by using these tips I can break my yips cycle.